SubContract Purchase Order is designed to maximize efficiency in creating sub contract purchase orders independent of any MRP action messages or reports. 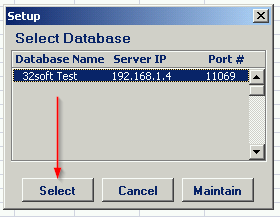 Pop Up Window will be displayed showing available databases to select from. If you do not see your database, please contact your IT dept. When Action buttons are selected for the first time, a Pop Up Window will be displayed for user log in. User ID is validated against QAD. 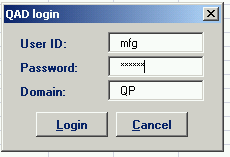 Use QAD user ID and password. Please note: if provided credentials are incorrect or the user is not authorized to create PO transactions in menu (5.7) in QAD, the database connection will not be established and the QAD login window will keep coming back. 2. Input search criteria in the yellow highlighted fields in top left of sheet. Item Number Range: enter the range of item numbers to download. Supplier: enter specific supplier number or range of suppliers. Leave blank for all suppliers. 3. Action Buttons – there a number of action buttons in the header. Download – if user enters any data in the search parameters and selects this button, it will download results based on the search parameters for existing open purchase orders. Using [DOWNLOAD] button – this button allows user to download existing purchase orders for the search criteria entered. 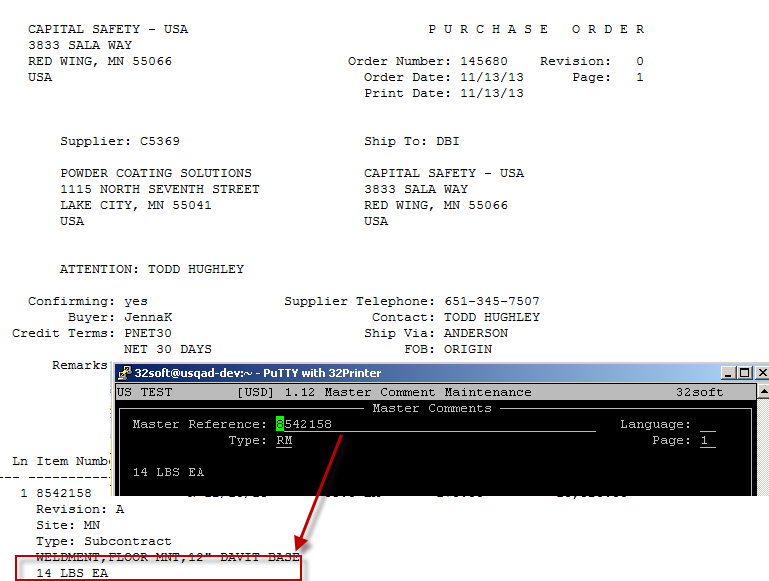 User can then copy existing lines (as template) to create new sub contract purchase orders. This loader will not allow user to make changes to existing purchase orders downloaded. Insert new line and clear the PO# field. Edit any of the fields in columns highlighted in green and enter “yes” the CREATE column. When ready, select the [CREATE PO] button to submit record into QAD 5.7 PO Maintenance screen. Type – indicates type of line. If inventory item, this will be blank. If non-inventory item (memo), this will default to “M” when lines are validated. Type in “S” for subcontract line. ID – this is the WO ID #. User can enter or if left blank, will prepopulate with WO ID from 1.16 when purchase order created. Create – user enters “yes” or “no” to indicate whether purchase order line will be created. Validating lines – there is a button in the header [VALIDATE] which when selected will validate the line items against Item Master (1.4.1) and Supplier Maintenance (2.3.1) as well as display the quantity on hand and cost. Cost – Editable field. If left blank, this will populate from the quote price field of 1.19 Supplier Item Maintenance or item cost. An error will be returned on [VALIDATE] if value entered different than expected cost. On [Create PO], the cost entered here will override expected cost. 5. Entering comments- if item or vendor exists in Master Comments (1.12), then vendor comment will display at PO header level and item comment will display at line level. All comments if exists in 1.12 will be displayed regardless of type or language. 6. Creating Purchase Orders – if the “CREATE” field has been entered with “yes” and user selects [CREATE PO] button, then it will initiate call into QAD to create PO lines in 5.7 Purchase Order Maintenance. It will populate the “APPROVAL STATUS” field with appropriate message when PO created as well as return the new PO # created in QAD. POs will be created grouped by supplier and site.